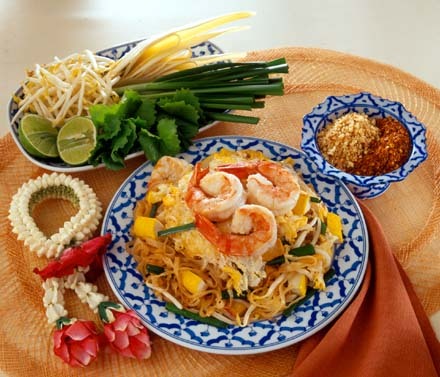 Pad Thai is the National dish of Thailand and one of my favorite dishes. Here is a great recipe for making at home. 1) Cook rice noodles al dente. Rinse and drain well. 2) Prep vegetables and have everything ready beside the stove. 3) Stir garlic and coconut oil in pot. Add curry paste and stir well. Cook 2-3 minutes. Add ketchup, vinegar, nam pla. Simmer a few minutes, remove from heat and add sesame oil and set aside. 4) Heat coconut oil and add carrots, cook until al dente, add cabbage and stir fry until wilted, add broccoli and continue to toss until broccoli is bright green. 5) Remove veggies and cook shrimp until bright pink. 4) Toss all veggies in sauce, add pasta and shrimp. Add fresh lime juice of two limes, add scallions. Beautiful dish. I’ve never made this but have enjoyed it out. You’ve given me inspiration. 🙂 I might give it a go.